Tashi was 11 years old when she went to school for the first time. She was lucky that her mother had asked her if she wanted to try school—almost no one in her village in Bhutan did so at that time. Her “one in a million” chance came when Tashi, the third youngest of eight children, became the first girl in the village to go. The school was a day’s walk away, so she boarded there and had to cook her own food. “It was very tough,” she recalls. A passion for education has been a key part of her life ever since. Now the executive director of the Bhutan Nuns Foundation (BNF), Dr. Zangmo devotes her energy to the empowerment of Buddhist nuns in Bhutan. Under the guidance of the Queen Mother, Tshering Yangdoen Wangchuk, the foundation focuses on helping nuns in this Buddhist nation become well-educated, well-trained leaders in their communities, closing educational gaps, alleviating poverty, and helping with hospice care. The nuns that the BNF trains are already doing much of this behind the scenes, explains Dr. Zangmo; the foundation simply provides the visibility and training they need to be most effective. 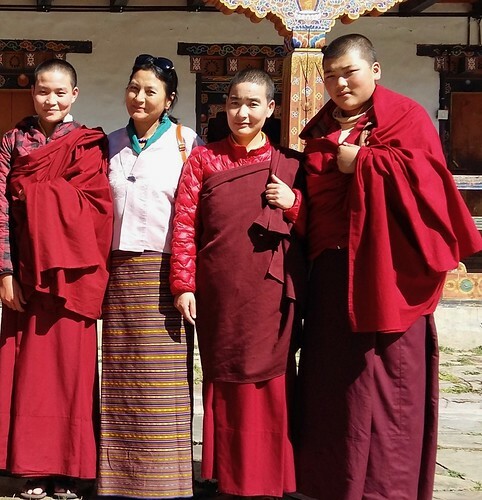 Dr. Zangmo completed her PhD thesis at the University of Massachusetts-Amherst on education for female monastics, and then returned to her home country determined to help the girls and women in Bhutan’s nunneries gain access to quality education. Founded in 2009, the Bhutan Nuns Foundation works with 28 Buddhist nunneries throughout the nation. Under the patronage of the Queen Mother, the foundation is dedicated to closing “gender and geographic equity gaps” in the Himalayan kingdom. Dr. Zangmo’s own educational path—studying in India and the United States—was unusual; most girls who seek education in Bhutan do so through religion. However, formal curricula for nuns remain unregulated and underfunded. One of the Bhutan Nuns Foundation’s stated goals is to establish a shedra, or monastic college, where the nuns can pursue higher education. The foundation’s main role so far has been identifying and building much-needed infrastructure, but Dr. Zangmo hopes that they are ready to begin moving into the provision of more training for the nuns themselves. This was her original goal, but was put on hold when she began the project. Dr. Tashi Zangmo with some of the nuns under the umbrella of the BNF. Unlike monks, many nunneries in Bhutan do not receive state support, and they sometimes struggle to meet basic necessities. Therefore, the foundation’s first 10 years have been spent building the necessary infrastructure to support Buddhist nuns: improving living quarters, providing access to running water, and building toilet facilities. Nearly a decade into the foundation’s work, Dr. Zangmo is optimistic that most of the nunneries have seen improvements in many areas. Dr. Zangmo notes that nuns, specifically, are the best and most effective changemakers in Bhutan. “The majority of the people are Buddhist,” she observes. “The first thing the people do when they get sick is go to the village monastics.” If the nuns are well informed in providing healthcare, they can better treat the community members who come to them and implement healthcare programs in their own communities, for example. “If they are qualified, they can benefit even more in becoming advisors or counselors,” she asserts. In other words, the Bhutan Nuns Foundation seeks to benefit not only the nuns themselves, but also Bhutanese society at large. Educating female monastics is in line with the country’s overall development goals, Dr. Zangmo believes. “I feel that nunneries have a major role to play. There are a lot of untapped human resources with the nuns especially—they have compassion, care, love, and yet much of their potential isn’t utilized. They lag behind; nobody really thought that they could do anything in society before we came on board,” she relates. Part of this is due to the deference nuns have traditionally paid to monks: the monks lead the religious rituals, while the nuns work behind the scenes. But 10 years in, she sees the situation is beginning to change. “People have opened their eyes” to the potential for nuns to be leaders in their communities, she says, and no one more so than the nuns themselves. Where before they didn’t expect themselves to be capable of starting a school or building project, now many nuns are starting to think of themselves as leaders in their own nunneries and communities. “If their mindset can change and they are empowered to become leaders of their religious communities, they can better reach out to all communities,” she says.